What is E-Diesel and Why Does It Matter? Audi says that the carbon dioxide used in the process is currently supplied by a biogas facility but, further adding to the green impacts of the process, some of the CO2 is captured directly from the ambient air, taking the greenhouse gas out of the atmosphere. Audi, along with the Dresden energy technology corporation Sunfire. Sunfire is Audi’s project partner and the plant operator. 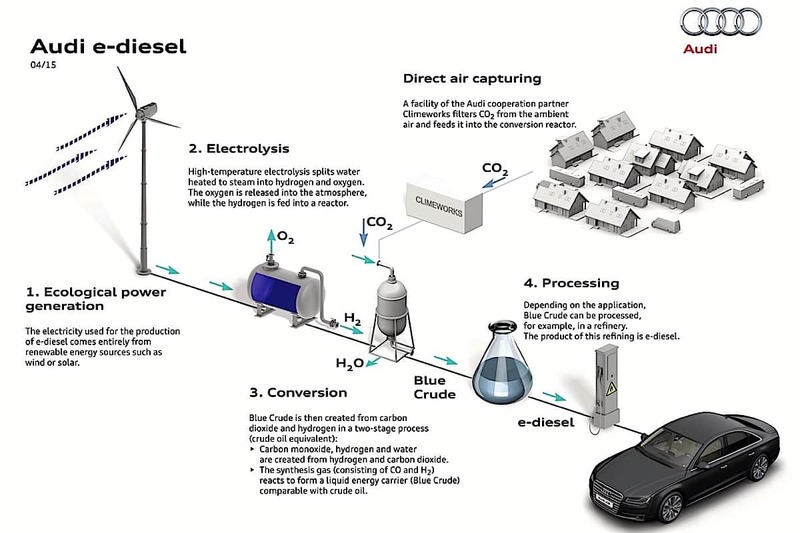 The CO2 used in the process to make e-diesel is currently supplied by a biogas facility. In addition, Audi’s Zurich-based partner Climeworks is also involved in the project. “One great advantage of this new fuel is its purity. It is free of sulfur and aromatic compounds – quite unlike mineral diesel. Its high cetane number means that Audi e-diesel is very combustible and its chemical composition makes it suitable for mixing with fossil diesel in any quantity. It can therefore be used as a ‘drop in’ fuel. According to newatlas.com, the fuel can be combined with conventional diesel fuel, as is often done with biodiesel fuels already.